Depending on which layer you want on the top of the popsicle, prepare that first. I went with green tea. Add coconut milk, matcha powder and agave to blender and blend until smooth. 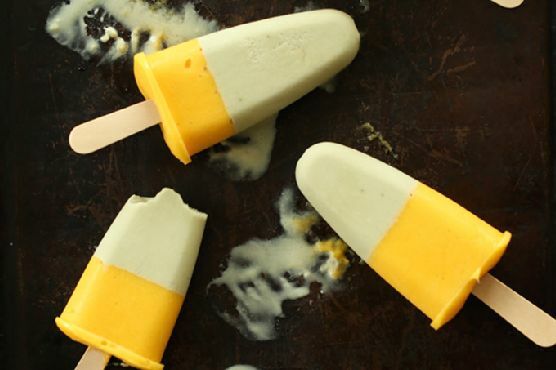 Divide evenly between popsicle molds - mine makes 6 small pops, so adjust as needed.Pop in the freezer to set briefly while you prepare the next layer. This will help them form two distinguished layers that don't run together.Rinse out blender and add mango, coconut milk and lemon juice. Blend until creamy and smooth, scraping down sides as needed. Pour over the green tea layer, tap to remove air bubbles, and gently insert popsicles sticks. Freeze for at least a few hours or until completely set. Remove from molds and enjoy! Store extras in a freezer-safe bag for up to a couple weeks, though best when fresh.